Mesh, vector, textures, sceneries, area sceneries, photosceneries… It’s confusing, isn’t it? My Guide to FSX/P3D scenery add-ons. 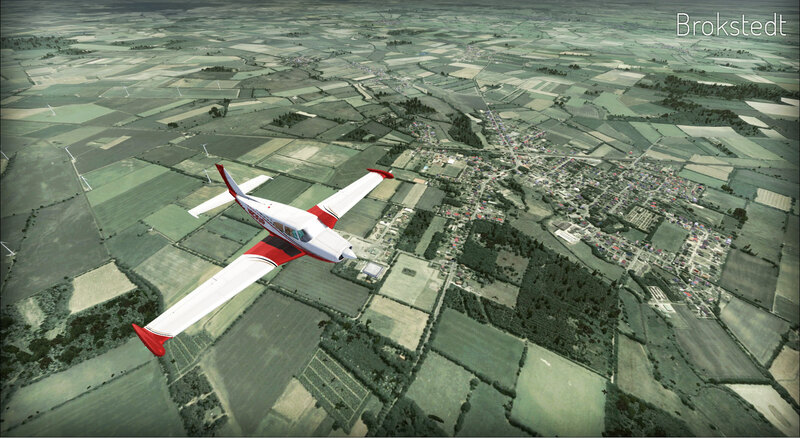 In this guide you will read about FSX sceneries – their types, their use and effects. I will also describe some products and show how they can include several different types of sceneries in one package. Wherever I use bold font for an add-on name in this article – it means that I recommend this product. Keep in mind that this is an add-on classification – not a technical classification of sceneries (although they are partly coinciding). Ok – lets start from the bottom. 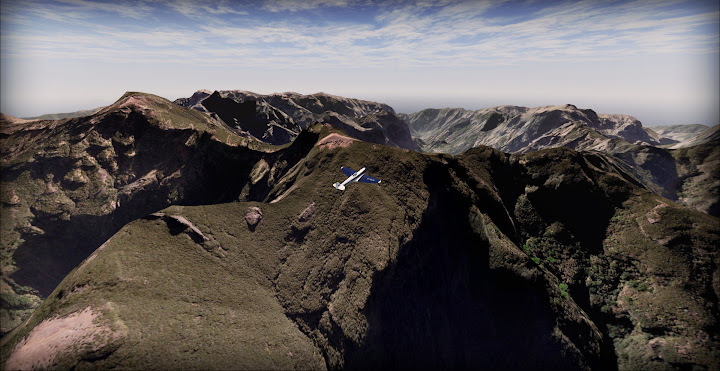 Mesh is a altitude reference data for FSX terrain. Each mesh scenery (including the default FSX/P3D mesh) includes a grid of coordinates. Each place where the lines intersect has a specified altitude and from this data the simulator draws all mountains, hills and valleys that you see. Mesh resolution is the space between the lines you see on the image above. 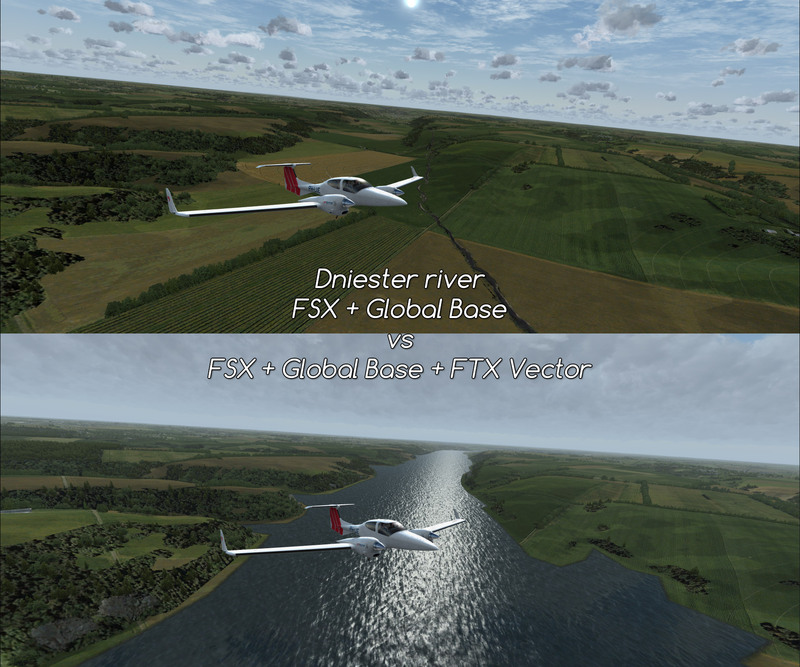 FSX uses mesh data of a resolution between 0,6m and 600m. By default FSX uses values of 10m, 19m (some locations in USA), 38m (USA), 76m (parts of Europe, Canada, Mexico). The rest of the world is covered by 150m and 300m mesh. This is why Himalayas look awful and Rocky Mountains – much better. Mesh is used in many add-ons – some provide mesh for large areas and some use mesh to enhance scenery. How it’s used? There are several freeware and payware mesh add-ons available. There is a 38m freeware mesh for the whole world – FreeMeshX. I reviewed it recently. There are also several payware add-ons. I am not really sure what is the point of paying for mesh if it’s not of a higher resolution than a freeware (most of payware mesh add-ons were published before 38m freeware mesh was available). Some sceneries include mesh. 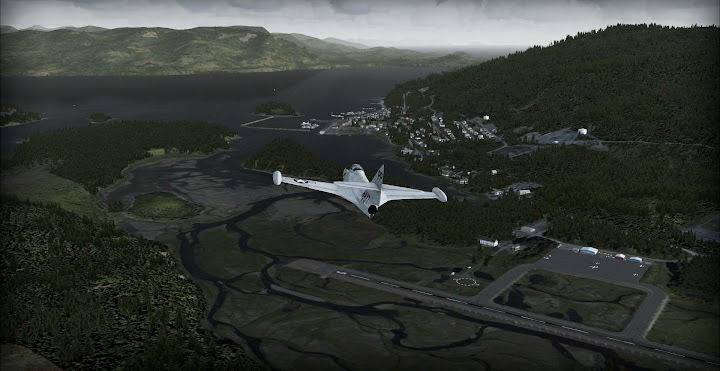 For example if you buy one of ORBX’s area sceneries (like FTX Norway) – it will include a mesh for this area. Be aware that ORBX’s FTX Global does not include mesh. Mesh scenery placed in Scenery Library above other mesh scenery will overwrite it at the range it covers. 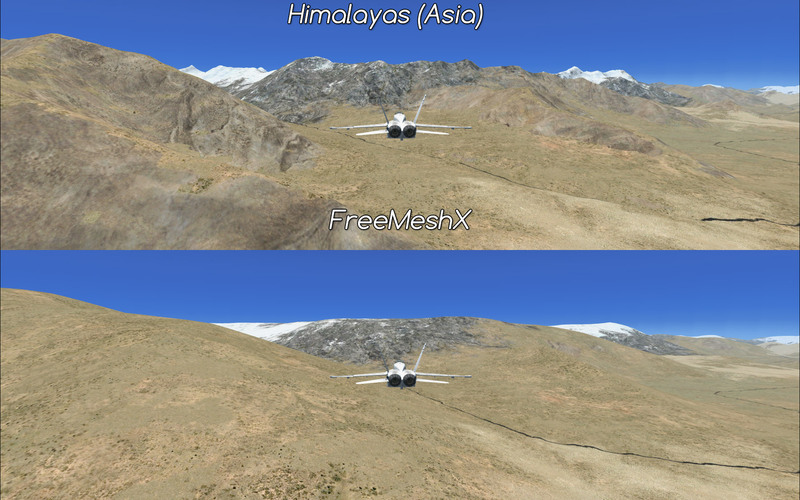 For example – 1m airport mesh will replace 10m area scenery mesh at this airport. You can not use two mesh sceneries for the same area at the same time. Texture add-ons replace some of FSX (Prepar3d) default textures. Some modify only some textures in selected regions (like freeware Mills’ textures for Europe), some target specific type of textures (like freeware replacement textures for rocks or forests). Other (payware) give you a complete replacement of textures for selected area (GEX) or globally (FTX Global Base). Read my review of FTX Global Base to see more images showing the difference. Texture add-ons for the same area and terrain are not compatible. You need to overwrite old textures to use another set. That means that having FTX Global and GEX or one of this add-ons and free textures for rocks makes no sense. You can have several freeware texture add-ons – provided that they are covering different regions or different kinds of terrain (one for rocks, second for forests). There are also add-ons that replace the following scenery features – roads, runways and even grass. Roads are replaced by a freeware add-on and by FTX Global Base (it’s either on situation). Runways and taxiways are replaced by some freeware add-ons and (oddly) by weather texture package –REX Texture Direct. 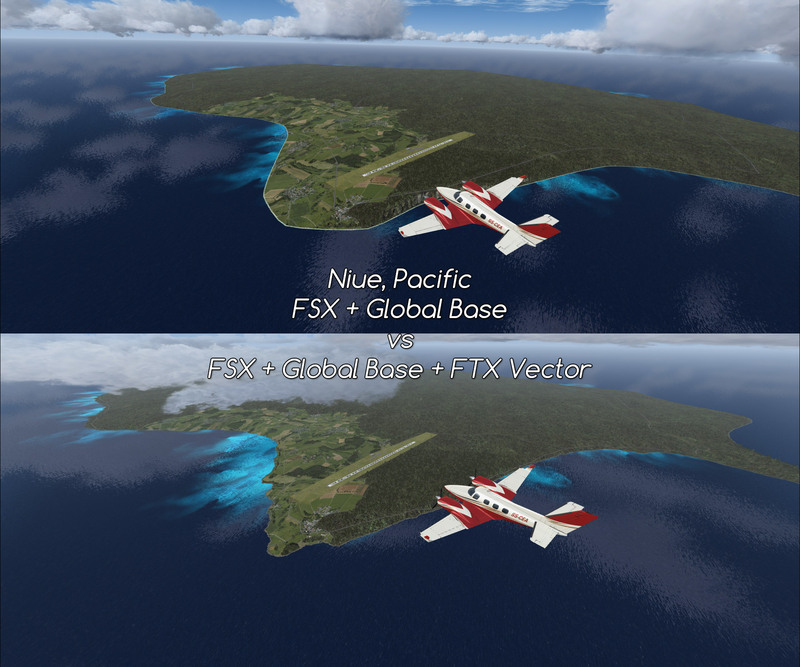 Replaced textures do not affect hi-end payware airports that use their own textures. Grass replacement is independent of any other add-ons. I described all the options in Grass HD guide. 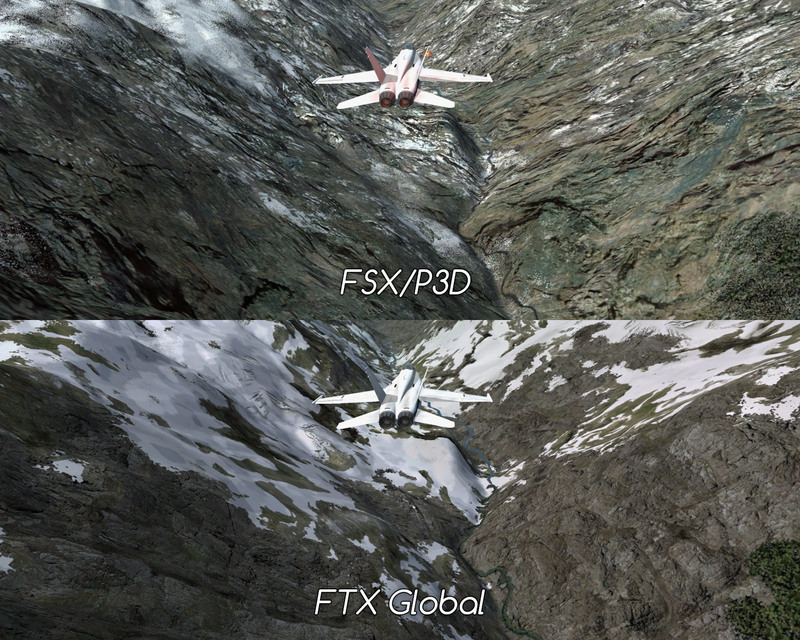 Some add-ons contain textures for their area – for example FTX Norway does (as do other FTX… regional sceneries). Also ORBX FTX Global openLC add-ons contain new textures. I explained how to modify your textures but how does the Flight Simulator X know where to place each texture? This is where the landclass scenery comes into play. There are around 150 types of terrain in FSX and P3D but even with this number – the default FSX landclass in not very precise. On the contrary – it often misses some terrain features and is unpleasantly repetitive. This is where add-on landclass can be useful. I have personally tested specialized landclass-add-ons for Europe (above mentioned openLC) and Scenery Tech Africa (reviews of both will be posted soon) and I really like the effects! Yes – landclass helps with the cities that were missing! Finally! I have some examples – there is a beautiful ski resort in Austria – Zell am See. It’s a small town… but you will not find it in FSX. If you install landclass scenery for Europe – it will appear. The effects are more pronounced in Africa – so many towns (even large cities) were missing – I could guess their position only from the road intersections. And with Scenery Tech Africa – they are there. There are also add-ons that include landclass. Ultimate Terrain X is one of such add-ons (it’s mostly a vector scenery, but adds also landclass definitions). ORBX FTX regional sceneries also include landclass (this time I will use FTX Pacific Northwest as an example). Small area sceneries (like Skiathos scenery) too. Position in the Scenery Library decides which landclass scenery will be used. The higher – the better. Vector sceneries add vector data – roads, railways, coastlines, forests, parks, rivers and lakes. You can see how a vector scenery changes FSX in my review of ORBX Global Vector. Vector data for a large area is usually included in area sceneries like FTX regions and even smaller sceneries – for example cities like Drzewiecki Design Warsaw need to use it for street layout. A term that I use to distinguish sceneries that cover a large area (a city, state, country or a continent) and provide various types of scenery in this areas. Another example such sceneries are extended airport sceneries – like Vidan Design’s Tuno, Aerosoft’s Madeira and many, many other. They use multiple tools to create an area around the airport – these may include all that I mentioned in case of FTX. Some area sceneries use only a few tools – for example VFR Germany by Aerosoft provides a excelent photoscenery covered with autogen and adds some points of interest, vector data and airports. Mesh and landclass are not included (landclass is not necessary when the whole area is covered with photoscenery). Read specific information for the sceneries you have. Local photosceneries are used at and around airports and some points of interest. They have limited range (usually tens, rarely hundreds square kilometers) and (usually) high resolution (15cm/px, 30cm/px, 60cm/px). 1m/px resolution is also used (but the effects are less impressive). Area photosceneries cover wider area. An Island (like in Tuno and Madeira sceneries) or a State (like in many freeware and payware sceneries for USA) or the whole country (Megascenery Belgium is an example). When used as part of area sceneries (like already mentioned VFR Germany) it usually comes with autogen and some scenery objects. When sold as a stand-alone product it is often delivered without any additions and makes your FSX look flat (there are no trees and buildings- you need to buy/download them separately – if that is possible). Good photosceneries (i consider 1m/px as good) give the most realistic look to the terrain in your FSX. But they often come at high price and you will often be in trouble looking for suitable autogen. They also take a lot of space (a small country of Netherlands takes 43GB). 5m+/px – what were you thinking?! A main disadvantage of a detailed photoscenery is it’s size and blurries caused by slow texture loading. That is why I consider 1m/px the best for large areas. 60cm/px causes severe speed restrictions (around 100-120knots). Remember that each size is four times that large than the previous one. Airport sceneries. Kind of self explanatory… mostly. A full scale scenery where the airport is designed together with a small (or sometimes quite large) area around it. An airport where you can fly patterns and stay over the quality-scenery. A scenery that ends at the airport’s fence. Sometimes a very good scenery – like Captain7’s/29Pamls Magdeburg. It’s perfect for airliners but general aviation pilots may feel a little disappointed when flying patterns over a default scenery – just next to the airport. Usually it’s a part of a larger payware area scenery. FTX sceneries have enhanced airports. Drzewiecki’s Miami focuses on the cityscape – but enhances the airports for better user experience. Sometimes “lite” airports are sold as a standalone product – I consider Aerosoft’s “VFR Airfields” series as mostly “Lite”. (Maybe they are just outdated?). In Aerosoft – they are sold at a very low price (starting at 3 Euro). AFCAD airport does not contain any custom objects – it’s just an updated airport design that corrects runway/taxiway/apron layout and uses the default FSX library buildings. Most of freeware airports belong to this class. A small group of sceneries that add points of interest – famous buildings, wind farms, stadiums, etc. Usually freeware. Buildings and vegetation that appear in FSX. Almost never sold as a standalone but quite a popular freeware add-on for photosceneries. Most area sceneries and extended airport sceneries (with the exception of standalone photosceneries) include autogen. For some of those photosceneries that have no autogen – there are freeware add-ons. The only provider of standalone autogen I know is openVFR. You can always reach me on Facebook – facebook.com/CAviation.net – just send a message. Mesh, vector, textures, sceneries, area sceneries, photosceneries... It's confusing, isn't it? My Guide to FSX/P3D scenery add-ons.